Taking a break at Tina’s Hot Dog Place on Montrose, I had a nativity in my hand freshly purchased for the second round of “Manger in an Alley” photos. I couldn’t resist photographing it on the table next to the ketchup and mustard. That’s one of things about this photo series, that I was concerned about. Would my series be interpreted as being too disrepectful? Some people might have a problem with having the nativity on the dumpster. But really. Look at Christ’s birth. It’s very disturbing. God of the universe born. He doesn’t come born to royalty. He’s born to poor parents. He’s not born in Jerusalem where all the high people are, but in lowly Bethlehem. Essentially Jesus was born in an alley. 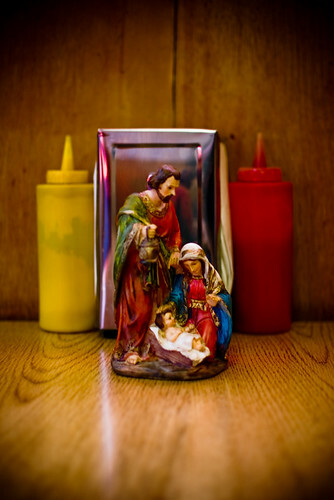 So a nativity next to mustard and ketchup? I like to think of that as Christ as reaching out to the everyday person. For now you can see Round 1 and Round 2 of the 2009 Manger in an alley.